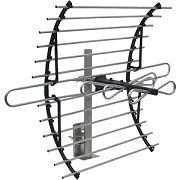 Are you in the market for a new outdoor or attic antenna? If so, it is essential that you find the best attic antenna reviews you can to help you make the best choice. Luckily, we have brought that exact thing to you! 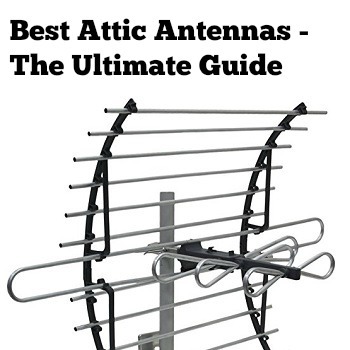 We spent nearly 100 hours and worked closely with half a dozen testers and experts to give you the largest and most informative attic antenna review on the internet! In this review, we list out all of the popular antenna manufacturers and test their products based off of 5 important metrics: Signal Performance, Durability, Ease of Use/Installation, Cost, and Overall Rating. We also define and break down the differences between the two most popular frequency formats: UHF and VHF. For your convenience, we have listed our top 5 choices in the table below. To read the more thorough review, just hop right below the table. One thing is for certain: there are a ton of outdoor and attic antennas to choose from! It can be easy to get overwhelmed when sorting through all of the various products out there. To make it much easier we have reviewed all of the major brands and outline each one below. 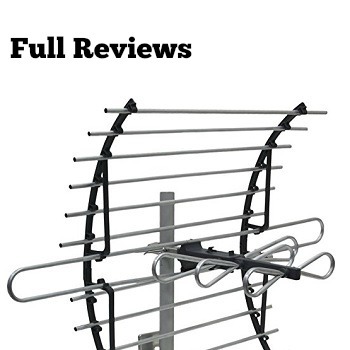 Click on any of the links below to jump down to our full review of that particular attic antenna. 1byone focuses heavily on a handful of item types, with TV antennas being one of them. 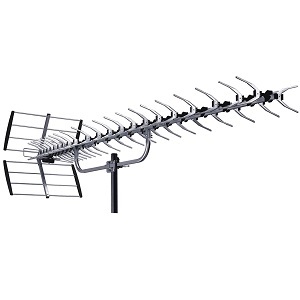 In regards to their available attic antennas and outdoor antennas, they have one of the largest selections out there. Many of their products are on the larger and bulkier side and are also a bit more expensive, but they promise excellent signal strength and handle HD signals (4K and 1080p) well and at quite a long distance. AILUKI sells a varied and seemingly random array of products, ranging from children’s toys to Wii cables to clock radios! As for their attic antennas, they sell a single product and it is the same design that many other brands offer and we assume that they likely import them from the same manufacturer. The price is reasonable and the signal is acceptable. AIRFREE Direct is one of the few brands that we have come across that deal exclusively in TV antennas (their name essentially suggests this). 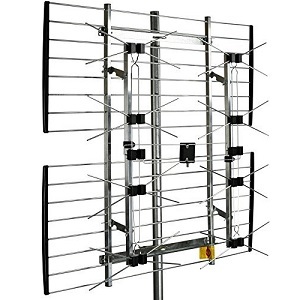 While their lineup is small, they offer three different models that we have come across: two indoor and an outdoor/attic antenna. 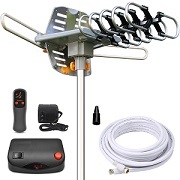 AIRFREE Direct’s attic antenna will likely look very similar to other models you have seen on this review and as far as we can tell it seems like it is the same unit albeit being more expensive than elsewhere. 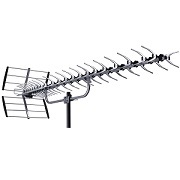 Antennas Direct has one of the, if not the largest range of antennas that we have come across. Their expertise spans both indoor and outdoor as well as a huge range of products, beginning with small-scale units designed to pick up frequencies at short distances all the way up to their commercial-grade antennas that can pick up HDTV signals at 70 miles away or more. Asking prices are a bit higher than average but is more than justified with Antennas Direct’s long experience in designing and understanding the antennas that they carry. 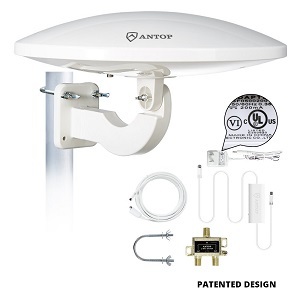 ANTOP’s outdoor/attic antenna lineup is rather limited, with their AT-416B UFO being the only unit we have come across. Despite the limited options, we must admit that the styling and design approach of ANTOP’s attic antenna is certainly unique and it stands out from the crowd. Instead of having jagged and large structures with various rods protruding out in every direction, this model is instead sleek and sophisticated. However, the advertised performance is a bit lower than we are used to seeing for the asking price. Bestrillion sells many different things and in regards to their antennas, they seem to focus mostly on indoor units. 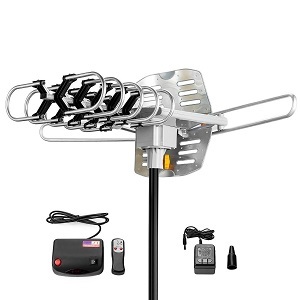 However, they do have a single outdoor/attic antenna that caught our interest and was worth reviewing. This outdoor product looks eerily similar to most of their indoor examples, but Bestrillion has beefed up the supports and walls to help better protect it against Mother Nature. It has an advertised range of up to 150 miles (which is a lofty goal) and is definitely in the higher end of the price spectrum. BoostWaves is in the business of everything antennas and their huge selection of indoor and outdoor antennas reflects this. In regards to their antennas intended to be used in an attic or outdoor settings, most follow a similar approach and look eerily similar in design and functionality. Mile ranges are advertised as up to 150 miles but, as we have seen in other brands with similar products, these numbers are a bit inflated in most real-life applications. Prices vary quite a bit despite the similarity among products but will typically fall in the mid-range price tier. 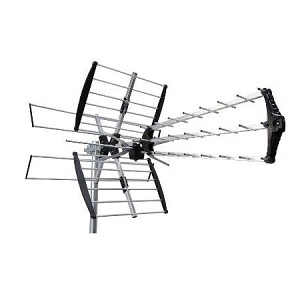 As their name suggests, Channel Master specializes in maximizing the number of channels you can receive through the use of their wide variety of antennas, both indoor and outdoor. Their products aren’t the prettiest and, in fact, are rather bulky and jagged with their arrays of metal rods sticking in every direction. And on the higher end of the spectrum, they can be rather expensive. But one thing is for certain: their performance is great and they are one of the few brands that really can stand behind their specifications in regards to signal distance and quality. Elechomes brings to the table a single product that fills our outdoor/attic antenna requirements. And it is certainly unique in both its styling and approach. 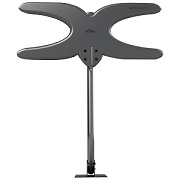 The HG-3926 is a 360-degree Omni-direction amplified HDTV antenna that is advertised as being good for up to 70 miles. The asking price is very reasonable but, as we have seen with many other products in this review, Elechomes’ performance ratings are a bit exaggerated in most real-life scenarios. Still, this is one of the few antennas we review that could be considered an indoor/outdoor hybrid. 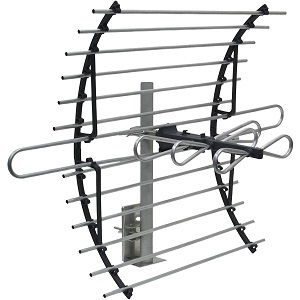 Elecwave makes a small lineup of very progressively styled antennas. While a majority of their products are for indoor use only, they do have a model that is designed for both indoor and outdoor use. This is accomplished through the inclusion of a waterproof boot that helps to protect the internal electronics from Mother Nature. Elecwave advertises up to 100 miles of range with omnidirectional capabilities and this all comes in a package that is very affordable. 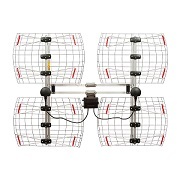 Esky brings us a lineup of larger outdoor antennas that are intended for attics or rooftops. All of their designs utilize the traditional approach of maximizing surface area for better signal pickup thanks to rows of metal (often times aluminum) rods. They advertise pickup range of up to 150 miles, 360-degree rotation, and all of the features you expect to see in a typical attic antenna. Their asking prices are also very reasonable. Free Signal TV is one of the smallest brands we have come across, selling just a single product: their amplified indoor/outdoor antenna. This product looks truly unique, resembling a box or breaker box more than an antenna. In addition, it doesn’t have to be mounted high up or really in any way that you are probably used to seeing antennas being mounted like. They advertise up to 100 miles of signal pickup. That being said, this product is very expensive. GE is one of the more well-respected and well-known products in the consumer product world and that is no different here with their popular lineup of attic antennas. Their product selection is quite vast, with most of their units being intended for indoor use. However, they do have a handful of outdoor/attic antennas as well and also vary in how they approach them. They have your typical large and bulky antennas as well as some of the smaller, more modular examples that have become increasingly popular as of late. Prices are quite reasonable overall despite being associated with the GE name (which can often time come with a slight price upcharge). Get (not to be confused with GE) is another brand that seems to sell a variety of products, most of which are likely imported from a separate manufacturer. Their primary attic antenna offering is the “150 mile/360 degrees” unit we have come across many times in this review already. In fact, it appears to be the exact same model. The asking prices also align with what other brands selling this same model for. InstallerParts is another brand that deals with quite a few different kinds of electronics. 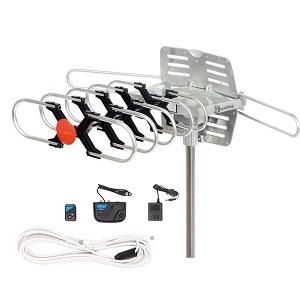 Their outdoor/attic antenna lineup consists of just two products and one is the generic model that we have reviewed several times on here already. The other is essentially a watered-down version of it with similar advertised product specifications. We have reviewed these same products quite a few times already so we will be brief but the general idea is that InstallerParts really isn’t doing anything new or groundbreaking and it comes in at about the same price as all of the rest. Jeje sells the same product as InstallerParts listed above with essentially the same customer service and asking price. To get a good idea of how their 360 degrees, 150-mile unit fares, please read it for more details. We will quickly go over the general idea below. 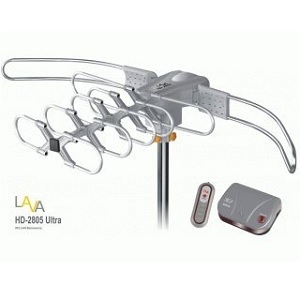 Lava Electronics has a rather diverse selection of antennas that are designed for indoors, outdoors, and attics. 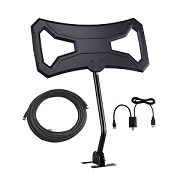 In addition, many of their products are very progressively designed and really stand out compared to many of the more mundane attic antennas out there. Performance varies depending on the model but seems to be about average. Asking prices are a bit higher than average, however, which is likely attributed to the modular and aesthetically pleasing designs of many of their antennas. 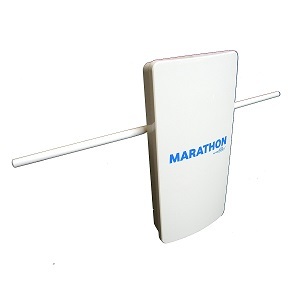 Mediasonic sells a single outdoor/attic antenna product, but it is among the most popular in terms of quantity sold. This likely has to do with its very attractive price point while still being serviceable. Mediasonic’s approach appears to be keeping things simple and focusing on suitable performance while driving costs down. This has clearly worked for their HW-27UV attic antenna. Mohu produces several extremely small, lightweight antennas that honestly resemble pieces of cardboard more than they do a conventional antenna. This makes them great for indoors or places where you don’t have a lot of room for storage. 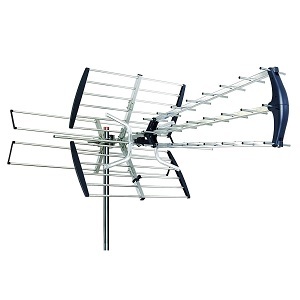 As for outdoor and attic antennas, they have a single offering: their Sky 60. As you might have guessed, the “60” represents the advertised range (60 miles). It is one of the smallest antennas we have come across but it is very expensive. Philips is another electronics brand that most of you have likely heard of. While they aren’t exactly known for their attic antennas, they do offer up a couple of smaller models to choose from. Despite having the somewhat reputable Philips name to them, they are extremely affordable. However, that does come at the cost of performance and, as you will see, durability as well. But they are certainly mobile and easy to stick just about anywhere you want. Pingbingding has a very interesting name so it is no surprise that their lone contribution to outdoor antennas is also quite interesting in its styling. Their outdoor antenna has an advertised range of up to 50 miles as well as the typical features one would expect to see on a quality antenna. All of this comes at an extremely cheap price that is one of the lowest we have come across. 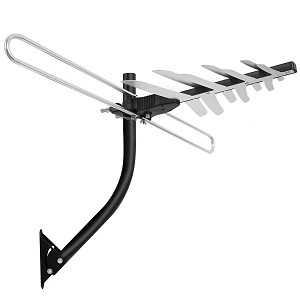 While PremWing does offer a nice variety of indoor TV antennas, their options are limited in outdoor selections. In fact, the only choice they have is the very common attic antenna that we have reviewed from other companies that exclaim 150-mile range and 360 degrees of signal pickup. We have discussed this exact product numerous times already so we will abbreviate the rating breakdown below. Range Xperts, as their name might suggest, take pride in maximizing their signal range. This is thanks to two noticeable features: having a large structure and also implementing amps in many of their attic antennas. They have several different product choices but nearly every example follows this approach. Furthermore, they try to accomplish this while staying relatively competitive in their asking price. RCA is another brand that is highly recognizable by your average consumer. They specialize in a huge selection of electronics spanning many different industries and applications. Their antenna choices are quite vast as well. Specifically, their outdoor and attic antennas are also relatively large in number and approach maximizing signal pickup in very different ways. They have the traditional size and shape antennas as well as more modern, portable examples. Asking prices vary quite a bit depending on which model, in particular, you are looking at. We had never had much experience with REMO Electronics before this but they offer up one of the largest and most impressive outdoor and attic antenna lineups in terms of sizes and variations that we have come across. In fact, some of their designs are so abstract that they sort of resemble futuristic space ships! As is the norm for companies that sell such a variety of products, specific performance numbers and price vary quite a bit depending on the model. Generally, however, they seem to give out good and accurate signal pickup levels and the quality is acceptable but they are a bit large and bulky. 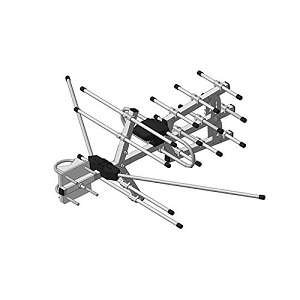 ROCAM brings to the table just a single TV antenna, but to their credit, it is a design that we have not seen before. One thing we have seen, however, is their exclamations of “150-mile range and 360-degree pickup!” that a couple other very popular outdoor antenna designs advertise. And, similar to those, you will be hard-pressed to get anywhere near the 150-mile range. 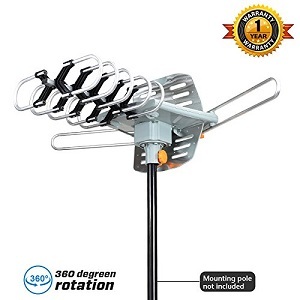 However, this antenna does have some unique pros and cons compared to that model and comes in at about the same price range. SkyTV’s single offering is the same style and type of antenna that we have discussed many times in this review: the 150-miles, 360-degree antenna. Same as before, real-life numbers are nowhere near this level. Sobetter specializes mostly in indoor TV antennas but also offers up the generic 150 mile/360 degree antenna we have reviewed many times. Stellar Labs brings to the table some relatively original antenna designs that seem to utilize the traditional method of TV antennas in which “bigger is better”. These large and somewhat bulky antennas will take up a lot more space than most but in return, you will enjoy above average signal pickup as well as a wide pickup angle than most other examples on the market. And all of this comes in at a price point that shouldn’t break the bank. Tree New Bee is in the business of importing low-cost items and selling them on online marketplaces. They are quite good at it as well seeing how their small lineup of 2 attic antennas are among some of the best-selling we have been across. That being said, their two units are the standard 360 degree and 150-mile max radius products that we have discussed time and time again on here. In addition, the asking prices that they sell them for are right at the range we are used to seeing as well. 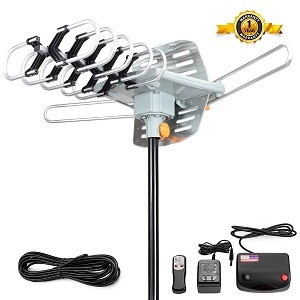 Vansky appears to specialize more in inside TV antennas as well as antenna stands but is somewhat limited in their outdoor models. Specifically, they only have one model that we have come across and it is the generic 150-miles 360 degree unit we have reviewed many times on here. Since we have beat the specifics of this model into the ground we will simply give a small recap and our ratings. VIEWTEK sells the standard 150 mile 360 degree unit we have discussed earlier in this review many times. Beyond that, they offer up a larger variety of antennas designed for the indoors. Price and performance are standard for this type of antenna. Since we have discussed is already many times within this review, we will abbreviate the main points of this particular attic antenna. ViewToo antenna follows the same song and dance we have seen many times: their one offering is the 150-mile 360-degree unit. 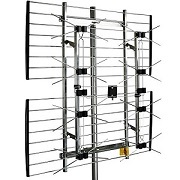 ViewTV has one of the largest TV antenna lineups that we have come across. Their huge and diverse product selection spans both indoor and outdoor antennas as well as antennas that utilize traditional methods of a signal pickup as well as more modern methods that take advantage of recent technologies. Their posted performance and specifications vary quite a bit depending on which model you go with and this also translates to somewhat varying asking prices as well. Vilso sells a variety of products. In regards to their antennas, they have a few different indoor choices but only one outdoor which is the same 360 degrees 150-mile unit we have discussed many times on here. For the sake of time, we will just include ratings below. Winegard has a large and rather diverse range of antennas, spanning from indoor, outdoor, attic, and even specialty units meant for RVs. Specifically, in regards to their outdoor/attic examples, there are a handful of products that utilize the conventional approach to antennas by being rather large and bulky but offering up good quality and equally good performance. But this achievement does come at the cost of a bit above average asking price. Xtreme Signal is in the business of offering up various indoor, outdoor, and attic antennas that not only look great but also perform equally as well. Their outdoor products are all rather large and bulky but this results in a good signal pickup as well as large than average reception angles. Asking prices are a bit higher than some but Xtreme Signal is confident their slight up charge in cost is worth it thanks to their superior performance. 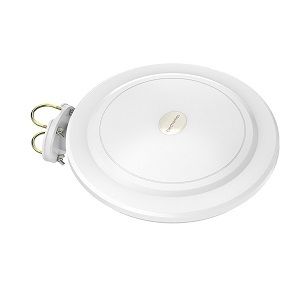 Zwireless bring to the table a single attic antenna. Surprisingly, their single offering is a bit on the larger and powerful side compared to most brands that only have a small selection of outdoor antennas. It is advertised as being capable of up to 100 miles of signal pickup. Also, it is quite affordable compared to most other units on the market. While trying to find the best attic antenna, there are several important factors you should consider. We outline some of the most important below and break each down in greater detail. This tends to be the most advertised metric for obvious reasons. Not only are things such as signal distance and pickup radius important but also factors such as what frequencies are picked up as well as decibel gain. Having an antenna with a long signal pickup is extremely important as this maximizes how many additional channels you can receive which is basically the entire point of an antenna to begin with. Also, the ability to handle HD and 3D channels are quite valued by many people who have compatible TVs as well. Don’t let the name fool you: attic antennas also commonly are used as outdoor antennas. Because of this, they are exposed to natural elements such as rain, the wind, snow, and random debris which can damage and potentially ruin lower-quality units. Also, attic antennas are commonly mounted in difficult to access places like roofs, trees, or other elevated areas which can be challenging to access once mounted. Because of this, it is important to have a product that lasts so that you don’t have to go through the hassle of climbing up to access it for tweaks or repairs. We look for antennas that are made of quality materials, careful design and construction, and also that have good warranties to back them up. There can be quite a bit of variance with how hard or easy a particular antenna is to mount and set up. Some can require a lot of initial installation and calibration while others come fully assembled and are basically plug and plays. We look for products that are simple to set up and use and are very user-friendly. Since attic antennas tend to be rather challenging to get to for tweaks or modifications, we also highly value those that are reliable and don’t need constant tweaking once installed. Always a major factor, the asking price is commonly a metric in our rankings. Attic antennas are yet another product that is rather diverse in their asking prices and can vary quite a bit when comparing costs to the features and signal performance that they offer. While you likely won’t find many examples that are exceedingly expensive, there is still a clear-cut line between budget, mid, and premium-priced offerings. Just because a particular model is more expensive doesn’t automatically mean that it will score lower. Rather, we take into account its relative performance, build quality, and features and see how it compares to other similarly-priced examples to get a better idea of the true value. This rating combines all of the metrics outlined above into an overall value. Typically, we encourage products that are rating 3.5 out of 5 or higher. Anything scoring 4 or higher is a strong recommendation by us. These are our full reviews for the best attic antennas. We go over all of the individual rating metrics in greater detail and provide you with an overall rating as well. Overall, the signal performance on 1byone attic antennas is excellent. Depending on the specific model you go after, you can expect anywhere from 50 to 70 miles of reception in optimal conditions. In addition, their models come in a very long beam width, ranging from around 30 degrees all the way up to their 360-degree models that are intended for marine applications. The signal strength is also strong enough to be able to handle HD and 3D signals, which many of 1byone’s units are optimized exactly for. Receiving frequencies are plenty wide in both VHF and UHF and in some cases they can even pick up FM radio signals. 1byone antennas come backed by quality construction and materials. While some of them may look flimsy due to their size and the fact that their elements due seem to extend out quite some distance, they are designed in a cross-phase, multi-element array that allows each piece to reinforce the ones around them. They are also waterproof and capable of handling strong gusts of the wind which will happen outside from time to time. For those who plan on simply sticking this in your attic, you shouldn’t have any concern. Furthermore, their marine antennas are sealed extra tight to keep out any unwanted moisture. These are larger antennas than the average example on the market and, with that, comes higher weight ratings. This may make initial transportation a bit more challenging, particularly if you plan on mounting this on the roof. Other than that, however, installation is a breeze. Most of the antennas come almost completely pre-assembled so that they only major task on you is simply mounting it. Once mounted, it is basically a plug and play and you are ready to go! These units are a bit more expensive than average but it is well worth the price considering the quality and performance you get to enjoy. 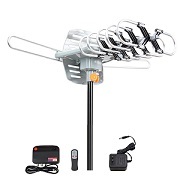 That being said, due to the high number of attic antennas that 1byone has, those on a tighter budget will still be able to find something that works for you (albeit they will likely have a bit lower signal strength). 1byone attic antennas really shine in just about every category. Not only do they have a nice selection of products that vary in signal strength and signal area, but all of them perform well compared to similar products, are plenty durable, and are relatively easy to set up. Prices are a bit higher but well worth it given the great product you are receiving. A definite buy in our book. 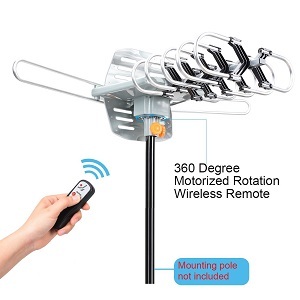 The posted advertisement says that the AILUKI antenna is capable of up to 150 miles of signal pickup across 360 degrees. We have found that this is a bit of an exaggeration in real-world applications and you should expect something closer to 60 to 70 miles maximum to make the most of it. In addition, this unit isn’t true 360 degrees as it will require being rotated to achieve it. Rather, you can expect to pick up between 30 and 70 degrees of frequency in a given direction. This isn’t terrible by any means: we just wish that the description of the product was more accurate. It handles VHF, UHF, and FM as well as HD but doesn’t seem to produce quite the HD quality as some of the other models we have come across. We do like the included 1-year warranty that comes with this product. We have found that build quality is acceptable although the mounting frame can be a bit flimsy. It should hold up to your typical outdoor environment for a few years without major issue and if you decide to simply stick in your attic you will enjoy years of performance. That being said, the rotating mechanism and remote are a bit cheap so you will need to be extra careful when handling them as we have seen plenty of reports of them breaking much sooner than expected. There is a little more assembly required with this unit which we assume is necessary to allow it to be shipped in a smaller box. In addition, the mounting pole is not included. Assembly is pretty straightforward but the installation manual leaves a lot to be desired so those of you who are not good at figuring out how to put something together without detailed instructions you may find yourself becoming a bit frustrated. The asking price is competitive given the posted ratings and the size. Since we feel that the AILUKI attic antenna should be relabeled more accurately as a 60 to 70-mile antenna (rather than the 150 miles it posts) it isn’t a homerun type of deal but it should be well within the budget of most people. But you will find noticeable improvements in other (more expensive) models. 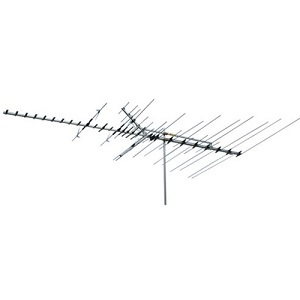 AILUKI offers us a single and very generic attic antenna that you will come to be very familiar with as you work your way down these reviews. For the price, the performance and durability are fine but we do wish that the manufacturer would not be so lofty in their posted specs, specifically in regards to the signal distance and the 360-degree capability. The durability and installation aren’t terrible but don’t blow us out of the water, either. The one-year warranty is a nice boost that makes this a soft buy for us. 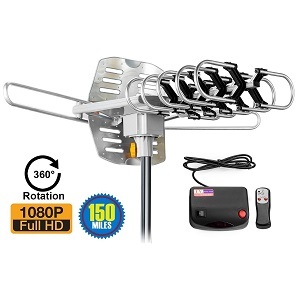 This attic antenna is advertised as being good for up to 150 miles and 360 degrees. As we have mentioned in the other reviews dealing with essentially this same unit, the 150-mile statement is a pretty big exaggeration in our experience and you should expect the maximum range you are comfortable with to be somewhere around ½ to 1/3 of that. The 360-degree range also requires you to manually rotate it so it isn’t a true 360-degree range in a given position. 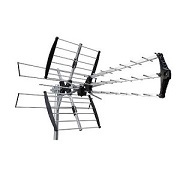 It is capable of VHF, UHF, and FM and can handle HD signals marginally well. The similar 12-month warranty that we have come to expect with this model is present here as well. The components are of design quality and should hold up during this time, particularly if you are putting it in your attic or live in an area that doesn’t have to deal with a lot of extreme weather and wind. One important note about this particular attic antenna is that it does come with a pole which is not always common in other similar products. This saves you the headache of having to chase down a pole that will fit. That being said, the pole is a bit on the small side so it may not work for many of you which means you will have to go through the effort anyway. This antenna requires quite a bit of initial installation and the instruction manual leaves a lot to be desired. But once together it operates without any major issue. We see almost this exact same unit sold by several other stores under different names but yet this one seems to be more expensive than most. While the inclusion of the mounting pole should allow it to fetch a slightly higher asking price, we still feel that it is too high seeing how you can find almost identical elsewhere for cheaper. Good on AIRFREE Direct for being able to sell this despite having a higher asking price. AIRFREE Direct antennas come in a small but popular lineup of both indoor and outdoor. 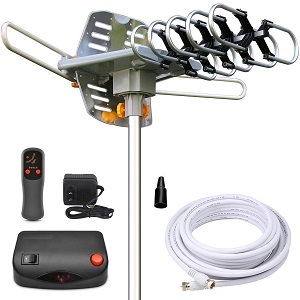 The outdoor antenna (which is the focus of this review) is a very popular design that we have seen elsewhere. The performance and durability of it have already been well-discussed but yet the asking price seems to be higher than other companies that sell it. We do appreciate including the mounting pole but for the higher asking price, we don’t feel it is worth the premium. Signal performance of Antennas Direct attic antennas, particularly for their size, is very good. Many of their units that were originally designed as outdoor fixtures have actually become quite popular in indoor settings as well due to their relatively small size and lightweight attributes. One thing that we really like about this brand is that they don’t try to wow you with lofty, often unobtainable numbers. Their ratings are very accurate and should be what you would expect. 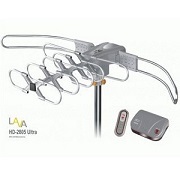 Their top models such as the ClearStream 4 and Directional UHF HDTV antennas have distance ratings of up to 70 miles. We have found that these are very accurate and even with some minor obstructions you should achieve numbers close to this. They do seem to focus on a particular type of signal with each of their products. Rather than trying to be decent at multiple, Antennas Direct instead wants to focus on being the master of one. So you will find that many of their products are labeled as being used exclusively for UHF signals, HDTV signals, etc. There are also some helpful patented features in some of their products such as the loop design in their ClearStream units that helps them stick out above the competition. All of these products are extremely well made and should hold up to a good level of wear and tear, both indoors and outdoors. For those using this specifically as an attic antenna, you should be content with both the build quality as well as the small size. We were actually quite surprised that the relatively lightweight and thin structure of many of these antennas can hold up to heavy wind and rain but it is for the most part true. Furthermore, Antennas Direct stands behind a lifetime warranty on parts for many of their products. This by itself shows the level of quality we are working with. The level of setup and assembly will depend on which antenna you go with. Some are basically built out of the box while others will require some assembly. Even the ones that require you to put them together seem to be pretty straightforward and the various components go together with ease. As we have alluded to above, these are very lightweight and easy to handle and install. People with small areas in their attic or on their roof will rejoice in how little real estate these take up. 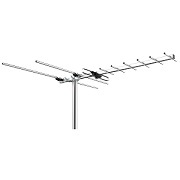 Antennas Direct attic antennas are towards the premium price range. However, this is more than justified by the fantastic product you will enjoy both in performance as well as life expectancy. Of course, having such a large lineup, there will be more affordable options but they will be a notch down in signal capabilities. We are really impressed with this brand, both in the scope of their products as well as the quality that stands behind them. Whether you go with one of their traditional shaped antennas or the more progressive-designed hoop designs, all perform exceptionally well and are easy to work with. You will pay a bit extra here but it is more than worth the cost of admission. A very strong buy in our book. In terms of range, you are looking at between 30 and 40 miles maximum with this unit. This is noticeably lower than a lot of other examples on the market. The petite and sleek design likely plays a part in this. While it definitely helps in the looks department, apparently having a less attractive appearance might help in signal performance! There are some helpful features such as a built-in 4G filter and tilting feature to help fine-tune the direction, however. But overall, due to the lack of range, you may be limited in applications for this. People who live in large towns or cities near towers might manage but for those who live way out in the country, you may have to find something with more punch. ANTOP attic antennas are advertised as being outdoor-friendly, but we have heard several complaints about the housing not really being waterproof. Allowing water inside to the electronics is recipe for the disaster and could quickly ruin the unit. 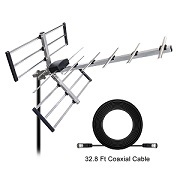 There is a 12-month warranty with the purchase of this antenna but we would encourage you to think long and hard about leaving it exposed outside to the elements despite what the manufacturer says. 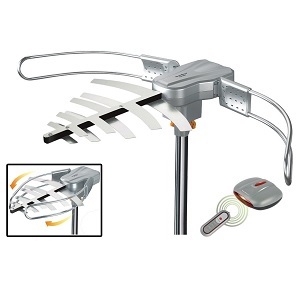 This attic antenna comes basically fully assembled and requires essentially no assembly. This is a huge benefit of these modular designs compared to more elaborate and large examples that can require quite a bit of initial assembly. Setting up the system is also essentially a plug and play. This makes it great for people who are not very tech-savvy and basically want a solution out of the box. Asking prices for this unit is a bit higher than what we have seen elsewhere for similar performance. That being said, this product does look much better and the fact that it comes ready to go out of the box may justify an upcharge in price. Whether or not this is a reasonable deal will really depend on the individual and what specifically they are after in their next attic antenna. 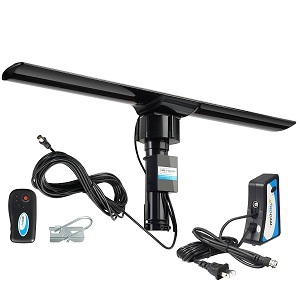 The ANTOP attic antenna is very limited in scope, being just a single product. But it is refreshing that they have tried to do something a bit different with their design and application approach. This unit is very user-friendly and requires minimal effort to set up. But the performance is a step down for other products in this price range which may be a deal breaker to some. We also wish it was a bit more resilient in outdoor settings. It is a soft buy depending on your desired needs. While Bestrillion states that this attic antenna is capable of up to 150 miles of range, we never experienced anything near that. More realistic values put it around 75 miles maximum. 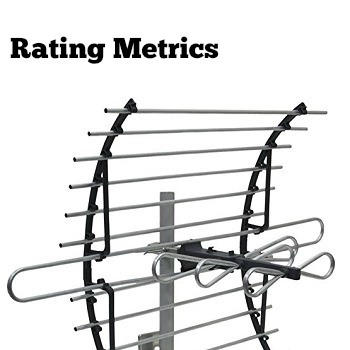 This isn’t a bad number is still competitive with many other antennas on the market. It comes in respectable ranges in both VHF and UHF frequencies at 86-230MHz and 470-810MHz, respectively. It is also a lot larger than you might suspect judging from the pictures. This likely plays a part in boosting the performance some but at the cost of added size and bulkiness. Another important thing to note is that, while it does have the ability to be leaned forward and back, you won’t have the level of flexibility rotating it around. This means you need to be sure to find the specific area you want it to point towards because it is likely staying put. The build quality is acceptable but what really makes the Bestrillion attic antenna survive outside is its simplicity. It doesn’t have a lot of exposed and/or fragile elements attached to it. Rather, it is more or less a thin plate. We do wish the base was a little thicker, however, as the unit is a little top-heavy and we would not be 100% confident of its stability in extremely high gusts of wind. There is a bit of installation required with this product. As you can tell from manufacturer pictures in the attached link, it comes in a box full of various components that you are responsible for putting together. Assembly is about average in terms of effort but those who simply despise putting things together will still be turned off. As mentioned above, you don’t’ have much flexibility in regards to where you point is once the base is screwed into place. This can make minor adjustments a lot more laborious. Given the true performance of this product, the asking cost is a bit on the high side. There are plenty of attic antennas on the market with a similar range that are more affordable, and some of them even come with additional features such as a rotating base. Still, it is a unit that functions reliably so we can’t be too harsh. Bestrillion’s lone outdoor antenna offering is a reliable and simple approach to help get more channels and better reception. Its large size likely helps in the acceptable range it has, but don’t go in expecting 150 miles as the ad description suggests. There is a bit more effort involved in the initial setup as well as tweaking but the build quality is fine. A bit high on the asking price but still not an awful choice. As expected, signal performance does vary depending on which BoostWaves attic antenna you go with. Since there is quite a bit of overlap between the different products, for the sake of simplicity we are going to state that there are around 5 different designs. On the lower end of these, you will experience adequate signal pickup of up to 50ish miles. And on the upper end, you can reach around 85 miles. This is noticeably less than the posted numbers of anywhere from 125 to 150 miles but it is still a very competitive number that is among the highest tier. The ranges of UHF and VHF are about the industry average, coming in at 21-29 and 1-12, respectively, and this comes with a 20-28db gain. The angle of pickup is not bad but the 360-degree remote-controlled base helps to minimize this issue and allow much greater flexibility in adjustments. Most products are also capable of properly handling HD signals. There have been quite a few complaints about the structural integrity of these units. They have been reported to be on the flimsy and “cheap” side and can sometimes struggle when exposed to high gusts of wind. The various components also can have some minor fitment issues. Specifically, the automated rotor at the base has been the source of much frustration. It seems to go out after a short period of time which essentially takes away the entire rotating ability of the product. BoostWaves does offer a 2-year limited warranty on their antennas but you will have to go through the hassle of having new parts shipped to you and replacing them. There is a decent level of installation with this product and, as mentioned above, fitment issues can make the whole process a bit more frustrating. While it does come with a pole, you will be responsible for adequately fastening/securing it to a stable base. We do wish that there was a more “all-in-one” package here. The 360 rotating features present on many of BoostWave’s antennas is a nice touch when it works but when it breaks (which is fairly common) you will have to deal with a huge headache. Asking prices are average to slightly above average, depending on which model you go with. The price range here is definitely above average but there are some rather glaring quality and user-friendliness issues that rear their ugly head. On the upper end of the prices, we would definitely prefer to see these issues be ironed out so that people can get more of their money’s worth. BoostWaves attic antennas offer up a decent selection of products that, for the most part, look and perform very similarly to one another. The performance is fine and we do like the rotating ability but the inconsistencies with parts and multiple complaints of the product failing while in use are definitely red flags. If you are willing to take a risk and gamble on the quality you may be content with this product but don’t plan on it lasting for many years ahead. 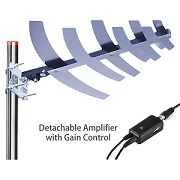 We are extremely content with the great signal performance you get with Channel Master Attic antennas. The stated ranged typically goes from 35 miles on the low end up to around 85 miles on the up end. From our experience, you will actually be able to achieve these ranges, too! The impressive figures come from some key design aspects. T antennas are rather large and maximize their surface area by the use of rows of long metal rods that really seem to “soak up” the signals in the air. It isn’t the prettiest but it certainly helps with performance. Depending on the model, you will be able to receive VHF reception up to 80+ miles with isolated reports of 100 miles distance being possible in ideal conditions. For UHF, 40 to 60 miles is common. They also do a great job of correctly capturing HDTV signals and even 3D signals. Frequency ranges are plenty large, dipping into the mid 400Hz and going up to nearly 900Hz and specifically for VHF and UHF, 50 to 220MHz and 470 to 700MHz are typical (respectively). Despite being fragile in appearance, Channel Master Antennas are surprisingly resilient and should be able to handle all but the most extreme conditions with ease. This is thanks to quality construction and the use of premium materials that handle wet and windy conditions much better than many of the cheaper alternatives on the market. We couldn’t find a lot of information on the specifics of the manufacturer’s warranty but we haven’t heard of any significant issues from anybody who has purchased on of these products in regards to components failing and needing to be replaced. Despite being complex in appearance, most of the parts come pre-assembled with you only having to snap the main pieces together on most antennas. That being said, these are relatively large units that do take up quite a bit of space so climbing a ladder to get to the attic or rooftop to mount it will require some extra attention and carefulness. And one hidden benefit of having great performance out of the box is that you won’t feel pressured to source out a super tall pole to mount it on. In other words, everything you need to properly install it will come in the box. The one minor gripe we have about Channel Master Antennas is the price: they certainly aren’t cheap and their higher end models are among some of the most attic antennas you will come across. However, for the performance, build quality, and ease of use the premium is more than justified. We are really impressed with how well Channel Master’s attic antennas do across the board. They are one of the few brands that actually can back their claims up with proven results. Their products are a bit on the bulky and expensive side but for those willing to pay it you will enjoy one of the best performing and most reliable products in the industry. These are a must-buy in our opinion. Despite claims of up to 70 miles range, reports show that you should expect closer to 30 miles maximum range with this product. This tends on the edge of being below average compared to most other examples. A couple shining points, however, is the nice signal range for VHF and UHF of between 170 and 860 MHz. In addition, it has a 360-degree signal pickup. So while you won’t enjoy 70+ miles of signal reception, you will not have to fumble with twisting and turning it to enjoy signals that are 30 miles away or less. That makes the Elechomes attic antenna much more suitable for city or suburban settings rather than being used out in the country. All of the electronics are housed in the UFO-shaped plastic shell. We tend to prefer rust-proof metal over plastic and, sure enough, there have been a few reports of this beginning to allow water and humidity to get inside after a period of use with it being outside on the roof. However, for indoor or attic settings it should be more than capable. There is essentially no assembly as the unit comes fully-assembled. Really, the only major work you will have to put into installation is sourcing a place to mount it and also likely purchasing the components that it will mount onto. For instance, if you plan on mounting it on a pole or rod you for additional elevation you will need to properly source one that meets the height and diameter requirements. That being said, it is very simple to properly secure it once you have these components. As for operation, the 360-degree pickup and essentially “plug and play” approach make it very user-friendly. The asking price for this Elechomes antenna is very competitive. Of course, you don’t get nearly the signal range that you will enjoy in more expensive products but the 360-degree pickup and attractive all-in-one packaging is a nice touch and makes it much more versatile in where you can mount it. Elechomes brings to the table a unique attic antenna in terms of styling and user-friendliness. As we alluded to above, this is one of the few products in this review that would look just as presentable on the roof of your home as it would mount on a wall in your living room. However, this does come at the price of much lower signal pickup strength. The combination of lower signal performance, as well as its ability to pick up frequencies in 360 degrees, makes it great for city dwellers but for those after something with more power you will likely have to shop elsewhere. 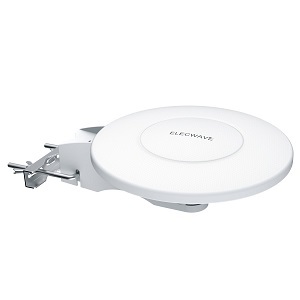 On paper, Elecwave attic antennas sound fantastic: up to 100 miles of reception, omnidirectional signal pickup, and it all comes in a discreet package. In actuality, it is somewhat less impressive than this but still serviceable. The actual viable range you will have to work with is closer to 60 miles and while the directional capabilities are above average, you won’t enjoy full 360-degree pickup. Small adjustments and tweaks will need to be made to pick up certain channels. Signal ranges are 87.5 to 230 and 170 to 860 MHZ for VHF and UHF, respectively. This is pretty standard and any channel within 60 miles should fall within this range. The primary difference between Elecwave’s indoor antennas and this outdoor attic antenna is the protective barrier that they put on the outside of the unit. This helps to protect the fragile internal electronics from moisture and debris and makes it so that it can be used both indoors and outdoors. The fact that the entire package is in a rather small and compact presentation also means it is better-suited for handling wind gusts and various objects falling on it without worry of them breaking off (this can be a common concern in a more traditional antenna that has thin metal tubes pointing everywhere). Build quality is acceptable and we have only heard of a couple seemingly random quality complaints. This product is very simple to install and get working thanks to the compact design. Once properly mounted, it is essentially plug and play. And that fact that it comes in an enclosed package means that there is little in the way of installation requirements. Furthermore, you don’t have to worry about sourcing various components such as a tube base to mount the antenna on as everything you need comes in the package. This example is actually very reasonably-priced. Sure, it typically won’t produce the level of signal performance that the advertisements exclaim but even real-life results are plenty acceptable and the all-in-one package and attractive styling make it a good value. The Elecwave antenna lineup only delves into outdoor settings on a single one of their products, but overall it fairs quite well. The modern design will look presentable in both indoor and outdoor settings and the protective barrier that Elecwave put on the outside is tough enough to allow for it to thrive in relatively harsh environments. Signal strength is more than adequate given the price. This is a good buy in our opinion. There is a bit of a range in posted maximum signal ranges but surprisingly we found that most of Esky’s antenna models seem to perform about the same. They are great for picking up signals (even in HD) at ranges up to around 40 miles. They will continue to function adequately up to 60 miles but beyond that, it is a lot less certain. This is way below the advertised 150 miles that they proudly claim but they certainly aren’t the first to make such lofty claims. Depending on which model you go with, the channel ranges for VHF and UHF can be a bit lacking so be sure that what channels you are after fall into the posted range. One big positive is that we noticed that, at short distances, the Esky antennas do a great job of providing a high-quality picture (this is likely one of the big benefits of having such a large antenna). There have been some notable complaints about the quality of these units, particularly involving the materials of the metal rods. Many products seem to utilize a very soft aluminum which can easily be damaged or broken both in the box they come in as well as during installation and regular use. Extra care needs to be taken when handling one of these antennas and if you live in a location with particularly high gusts of wind or debris that can become kicked up in the air you may need to find somewhere more secure to mount it or stick to the attic. There is a lot more assembly with Esky attic antennas due to their complexity and shape. In addition, they are quite large so storing and/or moving them will be much more daunting of a task. In addition, you will need to make sure that you have a nice large area open to mount it. Speaking of mounting, for those who don’t want or simply don’t have the space to stick it in your attic or on a spot on your roof, you will likely have to also find a proper pole to stand it on. And minor adjustments such as rotating it a few degrees or tilting it up or down will be a lot more laborious than with a much smaller antenna. One big shining point of these products is their asking price. They are all very reasonably priced and situated in the budget to mid-range. This makes overlooking some of the quality issues much easier. And despite falling short on signal range, for this price point, it is more than acceptable for most. We do appreciate the relatively large lineup of Esky antennas. While they all approach things in a similar manner, there is enough variety to cover most people’s needs. However, the performance is only average and there are some issues with the aluminum that is used on a lot of their products so extra care needs to be taken during handling. But for the attractive price, we can’t be too picky. This sleek design really surprised us with just how well it performed given the size and shape. You can expect relatively reliable channels up to around 85 miles away. It also fares well with HDTV signals and provides you with clear and crisp image quality. The 40 dB gain is also above average compared to what else is on the market. However, in order to enjoy these levels of performance, you will have to use the included channel booster (amplifier). There are some significant pros and cons associated with this design. The huge selling point is the simplicity of the antenna itself. It basically is a small box that is completely sealed outside of a few necessary connection ports. This makes it very resilient to the wind, water, and other natural conditions. However, the included amplifier which is essential for maximum performance is not nearly as well protected and also requires a plug-in. Since most people don’t have a plugin on their roof, this could potentially be a major weak point in resiliency. However, for people sticking strictly to the indoors or attic it might not be as big of an issue. This is one of the most simple attic antennas we have seen in regards to setting it up. Free Signal TV proudly advertises their simple “3-step” installation throughout their ad. The abbreviated version is that it is basically a plug and play unit. Also, being much smaller and lightweight than a lot of its competition makes installing it even easier. In fact, most people don’t even bother elevating it or installing it on the roof and rather mount it to an inside or outside wall in their home. However, as mentioned above, the amplifier (“signal booster”) can add a bit of complexity. This is an extremely expensive product. There really is no other way to put it. Compared to other brands and models out there, this is easily towards the top in regards to asking price. However, it does offer some unique benefits you won’t find hardly anywhere else as well as looking the part. But for many, the cost of admission will simply be too high. The Free Signal TV attic antenna lineup is just one product but it certainly stands out due to its impressive performance to size ratio, simplicity, styling, and high price tag. We certainly are impressed with just how much power was packed into such a small package and the simplicity of installation can’t be ignored. But it does come with a very high price tag and requires a signal booster that isn’t nearly as durable as the main component. We are really happy with the signal performance of all of GE’s antennas across the board. While they won’t make lofty promises like 125 miles in 360 degrees of direction, they offer a solid range from around 25 miles up to nearly 80 miles which are plenty acceptable compared to what else it out there. More importantly, these stats are actually possible in real-life applications. We particularly like how well they handle HDTV and even 4K signals if you happen to be within the range of a tower that produces it. Their built-in amplifiers do a great job of boosting signal pickup, going from +20dB and higher. This is great for those who live in the city who need just a little bit of signal boost to pick up a whole range of new channels. Extra attention was made to make sure that GE attic antennas are built with quality materials and no shortcuts in construction. This is vitally important when dealing with products that will be exposed to outside elements, which is common with attic antennas that are installed on roofs or other areas outside of the home. The materials are essentially rust-proof and have great fitment which keeps out moisture. The electronics are also up to spec, with no notable issues with them going out after a short period of time. For the rare case that a product does have an issue, GE stands behind their antennas with quick response time and great customer service that you won’t always find with smaller brands. The level of initial setup varies somewhat depending on which product you go with. However, for the most part, installation is average to below average in the required effort. This is particularly true on GE’s 24769 and 33685 units which can be quickly set up and be ready to go outside of the box. For other products, there are a few more steps but the setup is easily followed with the instruction manual. None of GE’s antennas are really designed for full 360-degree pickup and even the 24769 model which some would consider having this ability may require two or more for adequate coverage. Despite the reputable GE name, asking prices for their antennas are surprisingly affordable. They are right at the competitive price point and, given their reliability and performance, are actually bargains in our book. The potent lineup of GE attic antennas really has its issues sorted out and delivers reliable and simple performance across all models. You will actually enjoy close to or actual posted specs and GE hasn’t cut corners in materials or construction and delivers products that will last for many years to come. Initial setup is minimal in most aspects and the asking prices are more than fair. 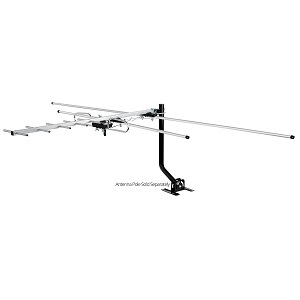 This is one of the top choices out there for a quality attic antenna. 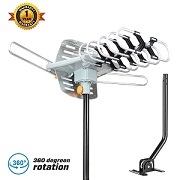 We have discussed the particular attic antenna many times and the conclusion is still the same: don’t expect to get anywhere near the 150 miles of range that it advertises. In addition, the 360-degree capability is only possible after rotating the unit. Thankfully, it does come with a base that allows for rotation and tilting but anything significant will likely require you having to take it down and manually move it. VHF signal is between 40 and 300MHz and UHF is between 470 and 890MHz. The same minor quirks this model had in other places are present here. Similarly, the 1-year limited warranty is also present. Don’t expect this unit to last for years as the materials are somewhat of low quality and have been reported to struggle with high levels of moisture exposure. How easy this is to install really depends on if you stick with the included base or not. For those planning on sticking it on your roof or side of the house/attic, it should be fine. For those that want more elevation, you will have to find a different base than the one that it comes with. We do like the remote as it helps for hands-free operation but, as we mentioned earlier, any aggressive or significant adjustments will likely have you up on a ladder physically doing it yourself. The asking price is typical for this model and overall falls about in the middle of the range. This isn’t a terrible price but at the same time nothing on this model really wows us so overall it is comparably priced. This is easily the most common of the attic antennas designs we have seen and it sticks to the same routine of overstating its performance. There are some design quirks that will shorten the life expectancy of the antenna but it is backed by a 1-year warranty so if they rear their ugly head in that time frame you may be in luck. As you might expect, the signal performance on paper is impressive but, yet again, falls quite a bit short in real-life. The 150-mile range is more like 50 or 60 on both units and the 360-degree pickup requires rotation (thankfully there is a motor on one of the units). The 32dB gain isn’t terrible but it doesn’t directly translate to overall impressive results. Durability is hit or miss. The materials used are cheap and are prone to cracking and wearing after a few years. How long it lasts will really depend on where you put it and how harsh Mother Nature is. If you leave it inside your attic it should last for a few years but outside that could be dropped down to just a few months before the electronics (particularly the rotating motor) start giving you grief. Installation is straightforward and depending on where you mount it where dictate the difficulty of using it. We do like the motorized base as it takes a lot of the manual labor out of fine adjustments (which there will be some). This is especially true if you decide to mount it on top of your roof or somewhere where it is difficult to reach. 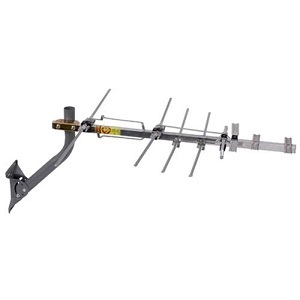 Asking prices for the InstallerParts attic antenna is right around what the other brands that are selling essentially the same unit are asking. We would consider it middle-of-the-road. IntallerParts sticks to the proven method with their small outdoor antenna lineup, serving up a couple of models that you have seen many times before. The same thoughts we had the other times we reviewed it are applied here as well: Way lower reception than posted, OK quality, and an average asking price. Way below the 150 mile advertised distance. Also, the 360-degree pickup requires rotating and you will never pick up a full 360 degrees at any point in time. Low-quality metal and electronic components. They will hold up as long as they are not exposed to harsh conditions. Best used in your attic or other indoor/covered location. The motorized feature is very helpful (when it works). Average asking price. About what you would expect given the posted performance. Jeje attic antennas consist of one product that we have seen countless times. If you are dead set on trying this particular model out then shop around because many different brands sell it at slight variations of asking price. Lava Electronics antennas are guilty of the same thing that quite a few other brands are: exaggerating on their numbers. Well, the numbers may not be far off but would require absolute perfect settings which few, if any, people will experience in the real world. A good rule of thumb that we have gathered from personal experience and others is to realistically expect about half the range that Lava Electronics posts. So a 120-mile product should be good for around 60 miles. We do like that they offer several non-powered antenna choices as well. While these won’t have nearly the range of powered units (since they will typically have amplifiers and/or motorized bases), they are much lighter and convenient since you don’t have to run power to them. But overall, the compact and stylish design is likely is a key factor as to why Lava products don’t have as great of a range. Despite the higher than average prices, there are some notable quality issues associated with these units. These attic antennas have a lot more plastic than we like to see and some of these components seem to be highly stressed and are prone to cracking when dropped or bumped. Also, the motors on the rotating units seem to burn out much quicker than we would like (this is a common issue with the motorized attic antennas). We wouldn’t recommend using one of these products in a very windy area as problems seem to pop up much quicker. The sleek and relatively compact design greatly eases the process of moving and mounting. Once set up, you can take advantage of motorized bases as well as easily adjustable brackets as necessary. Lava Electronics even offers some products with omnidirectional capabilities (although they aren’t fully omnidirectional from our experience). Once set up and running, the only major concern is with the durability and reliability of the units. Obviously when things break it will require you to go up into your attic or rooftop to replace or fix them. The asking prices for these outdoor antennas are certainly higher than we are used to seeing given the performance and life expectancy. We understand that they are much more attractive than most but the price hike for something that may not even be seen (if it inside your attic or on the back side of your house) may not be very tantalizing to many. Lava Electronics attic antennas have a nice selection and variety of products to choose from. Specifically, they have rotating, electronic, and non-electronic options and they come in some really unique styling packages. This instantly makes them stand out from at least 80% of the other antenna brands on the market. That being said, there are some noticeable lapses in performance and product quality that may make the higher than average asking price difficult to swallow for some. The advertised signal range at optimal settings is around 80 miles. In real-life scenarios, you can expect between 50 and 60 miles. For the price, this isn’t bad at all. In addition, within this range, the quality is surprisingly good and much better than many other, more expensive products on the market. You should be able to pick up HD and even 4K signals with good resolution and little static. 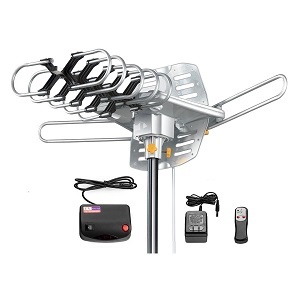 This attic antenna can handle all ranges of VHF and UHF frequency so you don’t have to worry about missing out on a channel simply because it is in a different range. This does come at a cost, though: the antenna is quite large and takes up a lot of volume. That being said, it still manages to be quite lightweight. The simple approach of Mediasonic’s attic antenna results in a product that can handle outdoor settings easily. Rain, wind, and even the occasional storm should have little to no effect on the unit outside of dropping performance for a short period of time. The metal used is most prone to rust and there are no exposed sensitive electronics that you have to worry about failing quickly. While we appreciate the simple approach, it might almost be TOO simple. Many key components are simply not included with the package. This includes necessary cables, a mounting pole, and some potentially necessary hardware. This means you will be responsible for chasing these down yourself which can be a huge headache. In addition, there is little in the way of adjustability so you will have to manually tilt and twist the antenna yourself to find the best setting. Sacrificing these components and creature comforts is a huge reason why Mediasonic is able to offer their product at such a low price but it certainly adds to initial setup. However, one strong point is that the product, while large in space, is very lightweight. The asking price here is truly awesome. It is among the most affordable you will find, particularly with the given signal performance and reliability. You will get a product that has equal to, if not longer, range than many examples twice its price and, with proper care, should last as long if not longer. Again, it is worth noting that this is accomplished in part by not including a lot of components that you will have to source out yourself. Mediasonic’s somewhat original approach has been met with huge success, with its attic antenna being among the most popular out there. Their performance and build quality when compared to the price are almost unparalleled and that factor by itself will result in a lot of sales. But for those after a quick and easy fix, you may be a bit disappointed as initial setup will be much higher on this on account of having to source some of your own pieces to completely assemble it. A definite recommendation for the frugal handyman but for everyone else: you may need to think a bit longer. In terms of a “size to signal distance” ratio, this Mohu attic antenna really can’t be beaten. Real-world results suggest a distance of up to around 50 miles is normal. This is not quite the 60 miles that they advertise but it is still a lot closer than many other brands get when comparing their theoretical range vs. their actual. And when you look at the compact size it becomes even more impressive. Mohu exclaims that this is accomplished via a patent pending Navy technology which means that you won’t find it anywhere else. That being said, it does seem to struggle more with VHF channels than UHF. So if you have some favorite channels you are after that is in VHF format you may approach a bit more cautiously. You can expect a 15dB gain. Being so simple and lightweight, there aren’t a lot of large or exposed components that can break or fall apart. It also means that the Mohu attic antenna is essentially immune to gusts of wind as long as it is properly mounted. But with the small size, you could easily stick it just about anywhere. And, for the sake of making this rather expensive antenna last as long as possible, we would recommend that you mount it in your attic rather than on your roof so that it doesn’t go through as harsh of weather conditions. In the case that something does go awry, Mohu offers a 1-year limited warranty which is about average for the industry. Installing the Mohu antenna is a breeze. Weighing only around 3 pounds, it is easily picked up and carried. Couple this with its extremely small size and you have something that can be easily stored and mounted just about anywhere. Also, all of the components you need to do a proper install are included. Since it is omnidirectional, you won’t have to worry about making fine tweaks or adjustments to pick up your favorite channels that are within range. A small, relatively powerful, reliable, and simple antenna? It comes at a price. The cost of this unit is among the highest you will find. For everything you get (which is a lot), you do end up taking a hit in terms of raw performance, however. The signal range of most attic antennas in this price tier can be 30% higher or more but they are, of course, typically much larger and bulkier. The Mohu Sky 60 antenna is truly unique in its design, application, and really how it approaches being an antenna. It is extremely small and compact and puts out a surprising amount of power despite this. In addition, it is extremely simple to install and maintain and quite reliable to boot. That being said, it is very expensive and will not be able to compete with many other antennas at this price range when it comes to raw signal distance. For those after a simple all-in-one package that looks the part, this may be a good purchase. But for those strictly after the highest levels of signal pickup even if it comes at a high cost and larger size? You may decide to pass. Both Philips attic antennas are quite small. While this certainly helps in the looks department, it also equates to below average signal performance. Philips exclaims that the SDV8622T/27 and the SDV8625T/27 will produce signal gains of 18dB and 22dB, respectively. This equates to around 30 to 35 miles of signal range. And for those channels that it does pick up, there still seems to be a bit of static, especially with HD channels. Also, the signal radius is a bit on the low side and you will have to adjust it quite a bit to find the desired direction and in the process, you will basically have to sacrifice additional channels that you could pick up if pointed in a separate direction. There have been many complaints associated with the durability of these outdoor antennas. Many of them revolved around the power cord more or less giving out after a short period of time when exposed to high gusts of wind. It appears that the cord is made of low-quality material and the connections can break when moved back and forth repeatedly. Obviously, an amplified antenna with no power isn’t of much use. Other complaints entail the electronics simply giving out even when they do have adequate power going to them. This likely has a direct correlation to being an outside antenna so you may want to stick to indoors or the attic to avoid wind and rain. Being a very small unit, these products are very simple to mount and start working. You will need to consider putting it somewhere near a power source so simply sticking it on your roof might prove more daunting than it is worth. Once mounted and plugged in, they are essentially plug and play. You will need to manually adjust it as necessary to maximize your signal pickup and Philips antennas don’t have motorized adjustment bases like some other examples we have reviewed. The major shining point here is the great asking price. These products should be well within just about everybody’s budget. However, as outlined above, you do give up quite a bit in the way of performance and durability in order to meet this attractive price point. 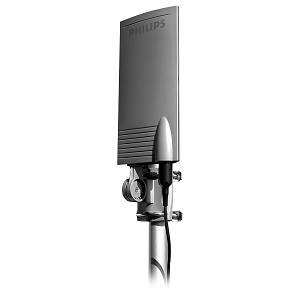 Philips antennas have been designed to be very low-cost and simple solutions to those after a little boost in their TV performance. However, “little” is the key term here as the results may not be noticeable enough for many. Also, various issues associated with the electronics on the unit make these not very outdoor-friendly. They look nice, though. Actual range vs advertised range isn’t too far off, being 50 miles compared to a real-life range of up to 40 miles. This is quite acceptable considering the simple, lightweight design and particularly the great asking price. UHF frequency range is 470-860MHZ but no VHF range is established so we assume that this wouldn’t be a good product for those after VHF range channels. In regards to gains, you can expect up to 22dB which is about average. Amplifier noise levels are also, for the most part, kept in check at less than 3.5dBs. What does all of this equate to? Anything within 40 miles or so should be picked up with acceptable range (even 1080p) but outside of that range, you may be out of luck. Effective angle is approximately 55 degrees. One obvious price you pay for a low cost is in the material selection. Pingbingding’s attic antenna is very thin and somewhat flimsy. Instead of having traditional metal rods, this product is constructed of what almost looks to be thin metal sheets that can be easily bent if dropped or pushed on. It does equate to a lightweight product but extra care will need to be taken when handling it and we also recommend putting it in areas that would be exposed to high wind or heavy rain. The internal electronics are of acceptable quality, however. We do like the 30+ foot long cord that comes with this unit. This makes powering up the included amplifier much easier. As mentioned above, this attic antenna is very lightweight so handling it on a ladder is much simpler. There are no fancy adjustable hinges or rotating bases on this low-cost solution so adjustments will have to be manual and with an optimal pickup range of fewer than 60 degrees, it will likely require some fidgeting to get the best results. This is one of the most affordable antennas we have ever seen. In order to hit this price point, it is obvious that Pingbingding had to make sacrifices in other areas (particularly in material and construction). However, given the great price point, performance and overall usability aren’t bad at all. The Pingbingding antenna has a funny name but the one thing we will really remember about it is the great price. While you won’t hit the 80+ mile signal pickup range of other, more expensive units, the performance is more than acceptable given the price. If you can find a safe area that is not exposed to strong natural elements this is a fine low-cost solution. Far below advertised 150-mile range. Still not terrible range but quite large in size. Acceptable build quality. Somewhat cheap materials used. The large structure pays off here. Range Xperts advertises ranges of between 70 and 85 miles on most of their products, which is certainly towards the top of the spectrum. As for what you what you will actually experience, it typically won’t be quite that high but still close enough to result in impressive results. You can expect up to 65 miles of signal range in most typical scenarios with these units. They are designed to adequately pick up both UHF and VHF signals and decibel gains are impressive at up to 30dB. These are rather thin structures and while the material used is of acceptable quality, the fact that they are simply so thin means that they are prone to being bent if bumped into or dropped. In fact, we have also read reports that heavy wind or hail can also significantly damage the more fragile areas. This really is a tradeoff: Range Xperts could go with a thicker structure to make it tougher but that would result in an even larger and heavier unit that takes up more space and is more challenging to install. It is apparent that they decided to approach this in a more lightweight manner. That being said, all electrical components associated with the amplifiers are safely hidden and secure. These are larger than average attic antennas but they are quite light due to the thin structure outlined above. Depending on which specific Range Xperts antenna you go with will determine how much initial installation is involved. However, most of the minor components will come pre-assembled and you will also have to assemble the large pieces together. There will be about an average level of adjustments required to fine-tune the direction of signal that you want to pick up. For the signal range, these are at a very attractive price point. Most units that have 60+ miles of proven range tend to be noticeably more expensive. For those on a tight budget and primarily concerned with the best signal range to dollar ratio, these are definitely going to interest you. Range Xperts has a nice lineup of simple and effective outdoor antennas that manage to have good range while being lightweight and affordable. The tradeoff here is that they are a bit more fragile but that is simply the price you have to pay to enjoy this. A solid choice. With such a diverse lineup of antennas, signal pickup range varies quite a bit. On the lower end, you will enjoy a range of around 25 to 30 miles with antennas such as the ANT702Z. On the extreme higher end, you will see range nearing 100 miles thanks to the huge 150” boom of the ANT3038XR. One refreshing fact about RCA antennas is that their posted range is pretty close to what you will see in real-world applications. This seems to be a sort of rarity among many of the antenna companies. A common theme we have noticed with RCA is that they approach the higher end of the signal spectrum in a traditional way in that “bigger is better”. They don’t utilize a lot of exotic of futuristic patented technology. They understand that sometimes simply making a product larger and spanning a greater area directly correlates to better signals. All of their products can handle a wide range of UHF and VHF frequencies as well as handling 1080p and 4K signals. RCA attic antennas are designed to last. They use heavy-duty metals along with locking mast clamps to help protect their products from the elements. And this is important as many of their antennas are quite large and could easily be affected by strong gusts of wind if not properly secured. The power components (as applicable) and the internal electronics are safe and secure and appear to function properly for a long period of time. For the occasional issue that may arise, RCA backs their products with a 1-year limited warranty. And you get to enjoy the RCA customer service that is much more efficient than many of the smaller companies can offer. While the quality components and construction allow for much longer product life, it also typically means that the pieces are bulkier and heavier. This is certainly the case here. RCA’s huge attic antennas can span 100 inches or more which makes them very large compared to other brands on the market. This also means that they are a good bit heavier. This makes them more challenging to carry as well as find places to mount and house them. Once you figure out this, however, they operate flawlessly. Other than a few minor adjustments to optimize the direction (RCA’s signal pickup is wider than most so you won’t have to worry about this as much), these units are low on the totem pole and maintenance. Given the performance and reliability, the asking prices for RCA antennas are more than justifiable. Compared to other examples out there, we have found that their prices tend to hover around the mid-range mark. RCA attic antennas really impressed us in all facets of analysis. Their large, sturdy structures equate to fantastic signal pickup as well as weather-proof resiliency. They may require more space than some of the smaller (and weaker) units out there, but the benefits easily outweigh this. Also, the asking prices are very reasonable considering everything that you are getting. These are one of our most highly recommended buys. As we mentioned above, signal performance varies quite a bit. As expected, the larger REMO units tend to have farther range compared to the more compact examples. An interesting point is that REMO is one of the few companies that are very accurate in their posted signal pickup ranges. In fact, in some cases, they seem to have even UNDERSOLD their ranges! For instance, their Neptune model states that it is good for around 25 miles but experience shows that channels up to 40 miles away can get picked up with good resolution. Probably their most powerful attic antenna is their BAS X11102 MAXI. With an impressive 38 dB of signal gain you can expect to potentially pick up channels 60 or 70 miles away. In addition, the channels you do pick up have great quality, even the HD and 1080p ones. With all of the tubes and features hanging off in every direction, many people would probably be worried that REMO antennas are fragile. Surprisingly, this isn’t the case at all. They are quite well-constructed and the metal and binding materials they use are of high quality. Natural occurrences such as the wind and heavy rain seem to have little effect on the longevity of REMO antennas. Furthermore, the fragile and sensitive electronics are well-protected from the harmful elements of Mother Nature. If there are any issues, REMO offers up a 12-month warranty that covers replacement parts. This warranty is about average for the industry from what we have gathered. Despite their bulky size, most of these units aren’t super heavy. This is a huge relief for those who plan on mounting their outdoor antenna on top of their roof on another elevated surface. However, that doesn’t take away from the fact that they are still quite large. You may have a bit of a challenge finding a spot to mount it if you are tight on space. Also, some of the potentially necessary mountain components such as a pole are not included so you will have to source this yourself. The asking prices here are more than reasonable given the quality craftsmanship and accurate and consistent signal pickup. From an aesthetic standpoint, you definitely aren’t paying for visually pleasing attributes as most would consider these antennas to be somewhat “ugly” and there doesn’t seem to have been many attempts to miniaturize the features. REMO Electronics is a brand that has flown sort of under the radar but has come out to surprise us with their extremely diverse yet viable lineup of outdoor antennas. We certainly appreciate that they decided to be accurate with their performance figures rather than inflate them. Their build quality is more than acceptable and the asking prices are perfectly reasonable. They are a bit large and not very attractive but for those with plenty of space and primarily concerned with performance at a reasonable price, this brand is worth checking out. We have heard the 150-mile statement countless times and in nearly every example the real-life range is nowhere near that. In fact, what you will likely actually see with this model is far below that. Expect signal pickup of around 30 miles maximum unless you live in a very open area with little in the ways of trees or hills. Frequency pickup is approximately between 40 and 860 MHz and you will see VHF and UHF signal gains of around 20dB. At this signal gain, the actual signal pickup distance of around 30 miles sounds about right. One thing that is holding the ROCAM attic antenna back from having a bit longer range is its compact size (which obviously has benefits as well). An important thing to note about this antenna is that it is made of a lot more plastic than most other models. While some people may be turned off by that, ROCAM actually advertises it as being advantageous. They state that being made of the ABS plastic shell will minimize the likelihood of it being struck by lightning. While we can certainly see this as being true, we have never personally experienced an antenna being struck by lightning so we don’t really know how common it is. But if you live in a flat area with little trees and your antenna would be the tallest structure around then we could absolutely see that coming into consideration. We aren’t a huge fan of how flimsy the electric cord is, however. We will that they would have done a better job of hiding it or tucking it into the body near the antenna itself. The big selling point with this product is the motorized base that allows for 360-degree rotation. This will likely come in handy as the signal pickup is nowhere near 360 degrees so you will be forced to point it in a particular direction that best meets your needs. Also, the fact that ROCAM antenna is quite small and lightweight makes it incredibly easy to transport and mount. You won’t have to worry about struggling with a heavy or bulky metal object here. The asking price is about average here and right in line with other similar models that promise similar characteristics. We will say that from a looks perspective, this model is much more pleasing. The compact design and molded plastic shell is attractive enough to even be used indoors which is something most other outdoor and attic antennas can’t say. ROCAM sticks to a popular formula of way overshooting actual numbers but sticking to a reasonable price. The difference here between most other cases is in the approach: they go with a plastic shell and a smaller design. This does affect signal performance but also makes the unit much easier to use and also more attractive. If you want something simple and have plenty of signal towers nearby this may work. Otherwise, you will probably want to go with something that has much punch. You will get closer to 40 to 50 miles maximum range here. Also, the 360-degree rotation refers to the motorized attachment that allows you to adjust the base accordingly. 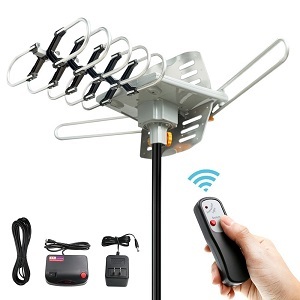 This will be necessary to pick up the best channels. Same old song and dance. This unit has decent construction but the materials are somewhat low quality. Also, the motor in the rotating features has been known to go out prematurely. Relatively lightweight and the motorized feature is very helpful when it works. 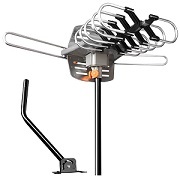 The SKYTV outdoor antenna is essentially the same price as all of the other similar models on the market. We have seen this model many, many times so we won’t go into great detail about the virtues and negatives. All in all, it is a decent model but by no means the best you will find, even at the good price point. Depending on which Stellar Labs antenna model you go with, signal pickup will range from between 25 miles up to nearly 60 miles. Also important to note is that the range angle is also quite good. This is a very important metric as it means that you will be able to “catch” more channels when the antenna is pointed in a given direction than many other models on the market. And, in some cases, Stellar Labs has antennas that actually can pick up channels in all directions (albeit at different intensities). The secret formula here really isn’t a secret at all: they utilize good old fashioned large metal rods and amplifiers to maximize signal pickup. In regards to specifics, dB pickup typically hovers around the 20 to 25dB mark with the omni-directional units having around a 10dB pickup on the sides. It can handle both UHF and VHF but seems to do best with UHF channels. The build quality is excellent here. While it does increase weight, Stellar Labs didn’t take shortcuts in their material selection for their attic antennas. They are made of quality metals and plastics (as necessary) and can handle typical wear and tear with ease. This is important as these are rather large models and high winds and heavy rain could do a number on them and their mounting points if quality took shortcuts. The electrical components are also well-protected and should hold up for several years without major issues. Despite their size, most of the components come pre-assembled and final assembly shouldn’t take more than a few minutes. Really the only major challenge is handling the antennas on ladders and finding a place in your attic or on your roof to stick the huge things. Their extra wide signal pickup angle is very helpful here as it means that you shouldn’t have to fumble with fine adjustments as much as other models. Given the pickup range and quality of manufacturing, the asking prices are quite good. Compared to everything else out there, you are looking at the mid-range but Stellar Labs attic antennas perform far better than “mid-range”. Stellar Labs offers us up a series of antennas they don’t try to wow us with advanced features or compact designs. Rather, they take advantage of quality materials, expert workmanship, and a good understanding of signal technology and deliver it in a large and sturdy package at a reasonable price. Anybody after a “set and forget” model that can pick up channels in a wide area, consider these. We have discussed the specific flaws of these two units many times already. To recap: the 150-mile range is vastly over-exaggerated compared to what you will actually experience in real-life applications. In addition, the 360-degree pickup entails having to move the antenna in a circular motion since the pickup doesn’t shoot out in all 360 degrees (AKA it isn’t omnidirectional). As for frequencies, both products pick up the standard UHF and VHF ranges that we are used to seeing. This is a low-cost product and the quality of materials and construction reflect that. The motor, while helpful, tends to burn out sooner than you would hope. This takes away the “360-degree” feature that they so proudly advertise. If you happen to live in an area with strong winds and where heavy rain is common then you may struggle to keep the Tree New Bee antennas properly operating after a few months. There is a medium level of assembly associated with these products but it is by no means difficult. The instruction manual is relatively easy to follow and you don’t have to worry about having any exotic tools. Really, the only laborious things you will have to worry about is mounting the unit and also sourcing a pole to put it on if you are wanting some extra height. Size and weight specifications are about average and when the rotating motor works we will admit it is quite helpful. These two outdoor antennas come in right at the range we are used to seeing them being sold by other companies at. Compared to the industry-wide lineup, it puts them in the mid-range to upper budget range. This should be affordable by most but you are sacrificing quality and performance some to achieve it. There really isn’t anything new here to discuss. These two products have been discussed many times in this review already. Performance is exaggerated from the manufacturer and the relatively low asking price is negated by quality issues as well as the lower signal pickup than expected. You won’t see anywhere near the 150 mile posted range in just about every scenario. That value seems to be founded by absolute optimal conditions which you will seldom if ever, see in real life. Also, the 360-degree ability is only possible thanks to the rotating base. The unit itself is not omnidirectional. The materials are a bit on the cheap side which is how Vansky is able to offer this antenna at a reasonable price. Specifically, the motor is notorious for giving out way before most people feel that it should. While the antenna can still pick up the signal without the motorized base, it does take the 360-degree rotating ability out of the equation. Installation and setup are simple enough. And when the unit is operating correctly it is very simple to use. But when it does give out you will have to deal with chasing down replacement parts which can be somewhat burdensome. Similar to every other brand that offers this specific TV antenna model, the asking price is very reasonable. But it does come with sacrifices as mentioned above. Vansky is yet another brand that has decided to import the same antenna as dozens of other brands. The model is affordable but does come with some significant and documented quality and performance issues that it is important that you know about before purchasing. As you might have guessed if you read our other reviews of this same model, it suffers from the same issue no matter who sells it: the signal strength simply isn’t as strong as the advertisements make it out to be. We aren’t saying that it isn’t possible to achieve these results. Rather, in nearly every scenario in real-life, you will experience numbers far below. Expect around 40 to 50 miles maximum in most cases. This outdoor antenna is primarily made of metal but it is on the cheaper end and can fall apart after a few months, especially if exposed to harsh weather. While this isn’t that big of a concern to us (many units suffer from this), the bigger problem is with the motorized rotating base giving out prematurely. Installation and setup are simple enough. The level of effort you will have to put forth to maintaining and using this antenna will all depend on how well it stays functional and whether or not you can take advantage of the rotating base. VIEWTEK antennas are priced at the same price point as the dozens of other companies that sell this same antenna online. It isn’t an expensive price but you get what you pay for. As you might have guessed from reading our multiple other reviews of this same antenna, it suffers from some notable issues that really hold it back from getting a higher ranking. The relatively low signal strength and quality issues help to mask what otherwise would be a competitive price. You won’t get anywhere near the posted performance. Expect around 40% of the range in real-life settings. Decent design but the materials are a bit on the cheap side which makes them prone to wear and tear from outdoor settings. This is particularly true in regards to the motorized base. This antenna is very simple to use assuming it works properly. The issue is when the motorized base doesn’t work it can be somewhat frustrating trying to adjust. A competitive asking price and right in line with the asking price all of the other brands that sell this same unit price it for. An average attic antenna that has some noticeable quality issues and lower performance than advertised. But it is reasonably priced and not a terrible buy when it works correctly. As we alluded to above, there is quite a range in maximum signal pickup among various ViewTV antennas. On the lower end, they advertise pickups of just a few miles in their entry-level units. On the higher end, you will enjoy posted numbers of up to 165 miles! As for what you will enjoy in real-life applications, it doesn’t quite meet these lofty goals. The maximum you should expect to reliably see in regards to miles is 75. This is still quite impressive in its own right and we wish that ViewTV (among the many other brands that do this) would be more accurate in their signal pickup distances. These products have pretty wide ranges, particularly when an amplifier is used. You can expect up to 45ish to 320ish MHz in VHF and 470 to 860ish MHz in UHF. This means you should be able to view just about any frequency of TV channel that is within range. Also, it can handle HD signal all the way up to 4K with ease. Signal gain is quite good and, depending on the model, you may see as high as 30dB gain. 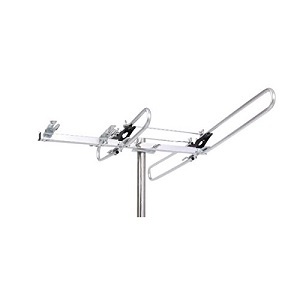 While there are some nuances that exist in specific ViewTV antenna models, they are, for the most part, pretty reliable. The biggest area of concern seems to be centered on the units that come with amplifiers. These amps are notorious for giving out and/or malfunctioning pretty early on. While an antenna can typically work without the amplifier, it significantly reduces the effectiveness of it. Other than that, the materials and construction methods implemented are acceptable and translate to a decent operation life. This is another metric that varies quite a bit. Many of ViewTV’s products are essentially ready to go out of the box while others require a bit of installation and assembly. In addition, some of their best-performing units are actually quite large and bulky (which is often a necessary evil in order to have higher levels of performance). This can not only make them a bit more challenging to squeeze into a nook in the attic but also in simply carrying it to your roof or other elevated surfaces. Signal radius also fluctuates so you may have to adjust the base some before you find the best direction to point it to meet your needs. Asking prices tend to fall around the mid-range for most of ViewTV’s attic antennas. This can either but a pretty good deal or only a so-so deal depending on the model. We also encourage shopping around but especially here as two models may seem similarly priced while one has twice the performance of the other. ViewTV is a bit of a challenge to give a universal rating as they simply have so many different products to compare. There are some very good buys within their collection while at the same time there are some products that fall a bit short. Signal pickup is actually pretty good and above average in most cases but there are some noticeable issues with the amplifier going out which essentially ruins an antenna. We give these a soft recommendation with the disclaimer that you should read up a bit on a particular model to see what its pros and cons are. It seems that a couple of Winegard’s most popular outdoor antennas are there HD7698P and HD7694P. These units are advertised as being capable of 65 miles and 45 miles of signal pickup, respectively. Refreshingly, these numbers are very accurate and you don’t have to worry about inflated numbers which are common in many other antenna companies. Also, the signal you do receive is of excellent quality thanks to the large receptor areas on the unit as well as helpful features such as the optional Winegard Boost XT LNA-200 amplifier. This not only increases pickup but allows for Ultra HD and ASTC 3.0 for those who are after crystal-clear 4K picture and even 3D. UHF and VHF frequencies are fully enabled and the degree of pickup is quite good as well. These rather large units are made of quality metal and can handle most outdoor settings with ease. Despite the somewhat fragile appearance that Winegard antennas can give out, the small components are securely fastened and can even handle being bumped or dropped without major damage in most cases. The sensitive internal equipment is safely housed and kept out of the danger of Mother Nature. And for the occasional issue, you can rest assured knowing that you have a reputable and established company in Winegard there to assist you with parts replacement and warranty inquiries. As mentioned above, these attic antennas are on the large size. However, they are relatively thin so as to not weigh a lot. This makes carrying them much easier outside of the size aspect. Also, the large size may limit your choices of where to store them, particularly if you had your heart set on tucking it away in the corner of the attic. As for installation, there is about an average level but most of the small components come pre-assembled for your convenience. Also, the range of pickup is good enough that you won’t have to constantly adjust the product to find the best direction for channels. Asking prices are slightly above average but this is a fair trade considering that you signal performance and reliability are both way above average. From our experience as well as discussing with others, most people are content spending a bit extra money for something that blows most of the rest of the competition out of the water. Winegard TV antennas are an excellent addition to the antenna market. Thanks to their conventional and proven approach of maximizing signal pickup through size, proper engineering, and quality construction, those who decide to go with one of their products will be very content. You may not have as much freedom with sticking these antennas in an area with tight space and they are a bit more expensive but both of these small negatives are easily overcome by the huge positives. The first thing you may notice when browsing Xtreme Signal antennas is just how large they are relative to other antennas on the market. While their smallest outdoor unit comes in at a relatively average 20” x 32”, their largest unit is enormous, being 110” wide and 150” long. This is among the largest examples we have reviewed. But this does also translate to above average signal pickup. While you may not initially be amazed by the posted specs (typically between 50 and 70 miles maximum distance), the refreshing part is that you will actually see these type of results. They aren’t simply “in a perfect world” numbers. In addition, the pickup angle is also very large, coming in at 60 degrees and going all the way up to 180 degrees on the HDBBX unit. All products can handle both UHF and VHF signals and maximum gains range from 14dB up to an impressive 23dB. The quality is on point with all of Xtreme Signal’s products. The materials used, while not the lightest, are tough and primarily made of premium metals that can handle outside elements. The sensitive instruments are safely protected and you shouldn’t have to worry about additional amplifiers or power components giving out prematurely. Xtreme Signal also offers a 6-month limited warranty on their products. Being larger units, they won’t be as simple to carry and mount as some of the smaller and lighter (and inherently weaker) products that other brands make. You will have to have a bit more planning when it comes to figuring out where you want to put the antenna, and those who want to stick it in the attic will have to make sure that there is ample space. However, despite their size, installation is very simple and they come mostly pre-made. Also, the fact that they have such great range and angle of signal pickup means that you won’t’ have to fumble with adjusting it as much as in other models. Asking prices here are average to above average but you really are getting a lot of product with that purchase. The performance and craftsmanship are far beyond most other models and despite the slight upcharge in asking price we still consider them a good value purchase. Xtreme Signal has a lovely lineup of large, powerful antennas that can handle anything you can throw at them. They are honest with the signal range and you can expect pickup that is among the highest in the industry as well as an extra wide angle. The build quality is great as well and these products are obviously designed to last. The asking price, while not the cheapest, is more than reasonable considering the awesome product you will get to enjoy. The combination of the large size, as well as optimal shape, results in an above average antenna in regards to signal pickup. While we don’t think you’ll quite experience the 100-mile range that Zwireless advertises, you should see 65 to 70 miles in most applications. Also, it can pick up both VHF and UHF signals and it even can detect FM signals, making it a sort of “all-in-one” solution. As mentioned above, this is thanks to the rather large size of the unit. Really, the one thing missing that is really holding it back from bumping signal strength to the next level is the inclusion of an amplifier (although these can be bought separately if desired). The durability here is about average. The metal and construction is a bit below some of the more expensive metal units on the market but it is still tougher than many of the super low-cost plastic examples you will find. As it stands, it can handle being outdoors as long as you don’t suffer from extreme weather. Where it really shines is in attics where it is protected from most of the outside elements. There is a bit of installation involved here but most people should be able to follow the instructions for the most part. Just don’t purchase this attic antenna expecting it to be fully or near fully assembled like some others or else you will be disappointed. Despite being relatively large, the lower quality metal means that it keeps overall weight down which greatly assists on transportation. You might find that you have to adjust the antenna some in various directions and angles in order to find the orientation you are looking for. A huge positive here is the great asking price. We found few antennas of this size and signal pickup that is as affordable as this. Yes, there are some sacrifices that are made in quality and features but for the price, we just can’t be too picky. Zwireless presents us with a very affordable outdoor antenna that performs surprisingly well despite having to use lower quality components. You will have to be a bit more careful with where you place it as it isn’t as tough as some of the more expensive antennas out there, though. All in all, this is an acceptable purchase for those on a tight budget but still looking for above average signal range. 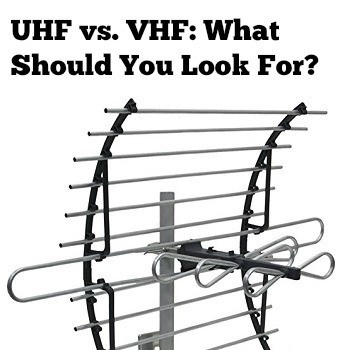 UHF vs VHF: Which Should You Look For? If you spend more than a few minutes browsing antennas you will likely see some common terms thrown around. Two of the most frequent terms include “UHF” and “VHF”. We get a lot of questions about what exactly these acronyms mean and which one someone in the market for a new attic antenna should be looking for. You will see many antennas state that they are good for just UHF, just VHF, and in some cases both. You may have also notice that there are different frequency values associated with each. But before we get into what exactly UHF and VHF are, let’s discuss frequencies in general and how they are controlled and regulated. Frequencies: What are They and How are They Regulated? Anything that transmits a signal does so on some sort of frequency. This can include radio waves, TV waves, walkie-talkies, and everything in between. Each of these mediums has a specific radio frequency range that they have to stay inside of. The allowable bands that a particular type of device is allowed to transmit in is controlled by the Federal Communication Commission (FCC). You might be wondering why we need a group like this in the first place, but what they do is very important. They help to create a standard that all manufacturers have to follow. Imagine how frustrating it would be if you purchased a TV antenna only to find out that most of the channels in your area were transmitted on a totally different frequency band! Also, there are certain bands that are reserved for government agencies, law enforcement, emergency personnel, truck drivers, etc. Making sure that these channels stay clear for their official purposes are very important. That being said, this is typically controlled on a national level and not a global one. Because of this, a particular country may have totally different bands for certain devices when compared to another country. This means that you may have to buy a country-specific device if you plan on being in that country. Also, you may want to make sure that any device that you bring over and try to use doesn’t interfere with one of the “official” bands that are only intended for certain users. Now that you understand how these bands are regulated, let’s go over what they are. For simplicity, we will assume that you are in the USA. For our international friends reading this, you will need to check your local laws and governing agencies to get your specific bands. That being said, the general idea here still applies. In the United States, VHF and UHF are the most popular and widely-used bands for frequency channels. VHF stands for “very high frequency” and has a low-band range of 49 to 108 MHz and a high-band range of 169 to 216 MHz (and a total range of 30 to 300MHz. UHF stands for “ultra-high frequency” and consists of a low-band range of 450 to 806 MHz and a high-band range of 900 to 952 MHz) and has a total range of 300 MHz to 3 GHz. However, even with these ranges are sub-ranges that are also regulated. Depending on your specific device and application, you will likely be governed to a certain sub-range as well. But what does this mean in simple terms? Simply put, UHF frequencies will be much shorter than VHF. VHF length will typically range between 9 and 20 feet in length while UHF will be between 1 and 2 feet in length. Coincidentally, VHF antennas have to be much larger than UHF antennas to capture the full range. VHF antennas also tend to be more affordable and are typically intended for non-professional applications. Other noticeable differences are in how the waves handle obstacles: The longer waves of VHF do much better and can pass through solid objects (both metallic and non-metallic) much easier. UHF will suffer from much greater interference and drop-outs when there are objects in between the signal source and where it is being picked up at. But UHF doesn’t come without some unique benefits as well. The FM signals in the UHF bands are much wider. In addition, transmitter power is much higher (maximum of 250mW). Furthermore, the available radio spectrum for microphone systems in the UHF range is almost 8 times greater than high-band VHF. This all equates to higher audio quality as well as a higher number of possible microphone systems hooked up to a single channel. But this comes at the cost of higher electricity costs, more expensive equipment, and more elaborate planning. We will quickly go over the regulated sub-ranges of both VHF and UHF below. VHF starts at 49 MHz and in this range, you will find wireless microphones, telephones, walkie-talkies, and radio controls used for toys, model airplanes, etc. In the 54 to 72 MHz region, you will find VHF TV channels 2 through 4. Around 72 MHz will be assistive listening wireless programming. As we keep going up you will find the range of 76 to 88 MHz. This is intended for VHF TV channels 5 and 6. At the top of the low band VHF range is 88 to 108 MHz which is what we refer to as the commercial FM broadcast band. 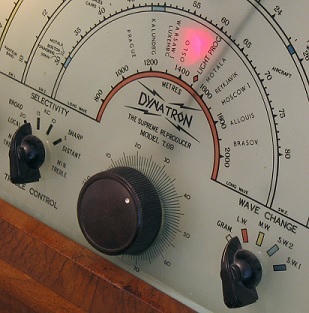 Low-Band VHF is very popular because it can easily accommodate high-fidelity audio by taking up a deviation of around 10 to 15kHz. In addition, due to the long wavelengths, these signals can easily pass through non-metallic surfaces. This is results in low equipment costs and wide product adaptation. However, this popularity comes at a price. There will be a lot of users in this range which can result in a lot of signal noise. This causes interference and can affect signal quality. Your transmission power is also very limited in nearly the entire range. Finally, antennas that can handle this range will have to be on the larger size to properly pick up the frequency. High-Band VHF is divided into two sub-bands. The first band is 169 to 172 MHz and has 8 designated frequencies used for wireless microphones. These frequency ranges are intended for the general public and what many people will know through the use of their walkie-talkies. Legal deviations of up to 12 kHz also mean you will enjoy good audio quality. In addition, being a bit shorter of a wave, you can get a proper antenna that is nearly 1/3 of the size of what is required for Low-Band VHF. That being said, you will still suffer quite a bit of signal noise in this range. Many non-government businesses will also use this range which only adds to the clutter. The second sub-bands of the High-Band VHF range consists of frequencies between 174 and 216 MHz. This range is where TV channels 7 to 13 call home. Each occupies 6 Mhz of bandwidth, starting with channel 7 at 174 MHz. Similar to other VHF bands, you can enjoy high-quality audio thanks to deviation limits up to 15kHz. Also, required antenna size is reduced even further, only being slightly over a foot in length. This sub-band is a lot less cluttered than others in the VHF range, even while housing the 8 TV channels. There are basically two overlapping bands in the region. The “low-low-band” region is between 450 and 536 MHz and the “high-low-band” region is between 470 and 806 MHz. The primary intention of these bands is in business services such as pagers and radio. In addition, many more TV channels fall in this range. You will find channels 14 through 69 here. Similar to unused areas of the VHF range, free UHF channels are available to the public (with proper licensing) but are less used due to the shorter range of UHF signals. Antennas in this range are quite small, only needing around 4 to 7 inches in size. That being said, they are quite expensive and diversity systems are recommended. But those willing to spend the high upfront costs, you can enjoy high-quality audio and many simultaneous systems. High-Band UHF is anything above 900 MHz. The primary users here for studio-to-transmitter (STL) applications. Similar to low-band UHF, users in this range will enjoy relatively little noise as well as higher potential audio quality and simultaneous systems. But they are highly regulated by the government and change constantly. 1.5 UHF vs VHF: Which Should You Look For? 1.5.1 Frequencies: What are They and How are They Regulated?